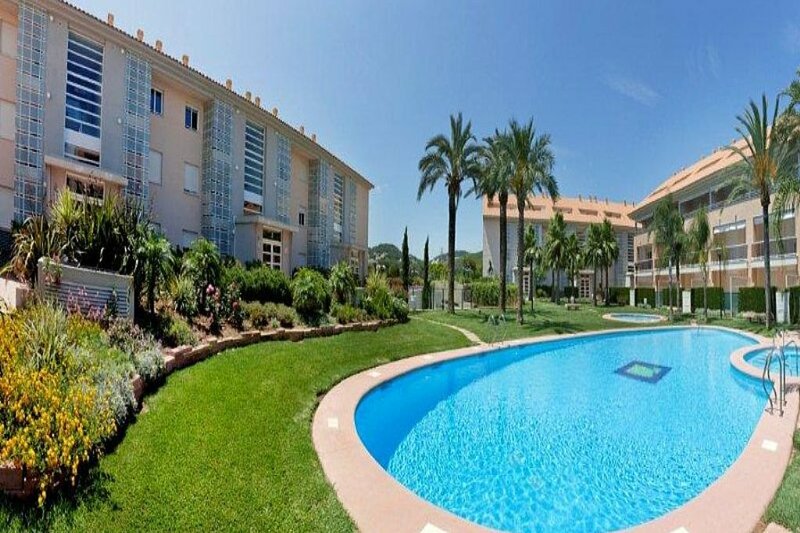 A luxury 2 bedroom first floor apartment (sleeps 4) with lovely private terrace and residents´ pool, gardens and gym. Luxury 2 bedroom apartment for up to 4 people in Javea, Costa Blanca, just a 5 minute walk to the beach. Nicely furnished, this modern 1st floor apartment with air-conditioning is in a beautiful complex with pool, gardens and gym. The apartment has a spacious terrace for outdoor eating and sunblinds to give you shade. Located in the heart of the Arenal sandy beach area, near the shops, restaurants and bars, shops and cafés, Golden Gardens is ideal for those not wishing to use a car while on holiday. There is a good supermarket just around the corner and just a 5 minute stroll from the sandy beach.